redpill's review (This content has been automatically translated from French)" Blah blah, for the fans ....."
I had this wah, new version, because I was asked to lay a tru bypass. I could test it at some length compared to other wah. Already, a point the poor quality of mechanical components. The most problematic is surely the knob (which is much in demand as in any kind of wah) is very small and with the track open to the outside (nest dust). It will not last long in my opinion. It will quickly spit out or be damaged by wear (FYI, it's the same knob that found in the volume pedal "Bespeco" was 20euros). Molo's better to go. Doubts also switch on the little bass / guitar. sound, nothing too amazing here, its a stupid filter has two options. Convaincus.Ca frankly not an illusion but it's still fairly "flat", with no personality and little interest. If you pass on the concerns that may be the potentiometer (everyone does not open its pedals to see that what's inside) It can parraitre innocuous but vital to a wah like this. AC is correct. After the sound is a matter of taste. 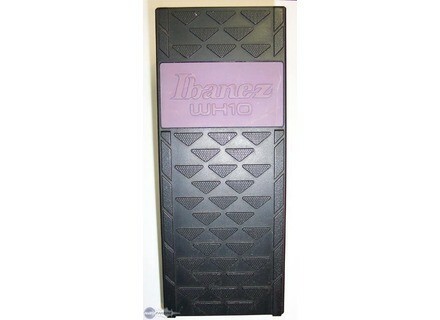 However, if there had been no popular Frusciante for this pedal, Ibanez would never reissued. But he said it would probably be a shame not to capitalize on its name and sell a ca fans who find it absolutely wonderful. niandra91's review (This content has been automatically translated from French)" Absolutely amazing"